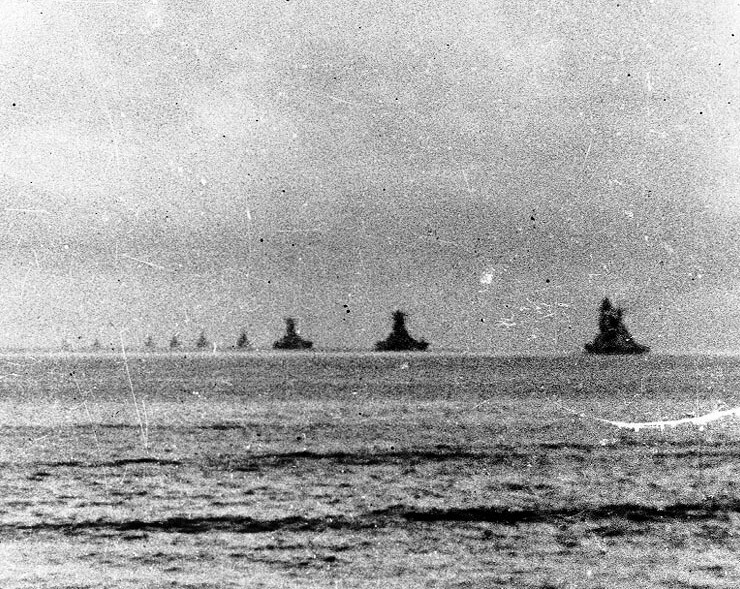 Yamato leaves Brunei Bay with the Japanese "Centre Force" fleet, 22 October 1944, for the battle of Leyte Gulf. From right to left, battleships Nagato, Musashi and Yamato; heavy cruisers Maya, Chokai, Takao, Atago, Haguro and Myoko. Source: U.S. Naval History and Heritage Command Photograph (# NH 63435), courtesy of Lieutenant Tobei Shiraishi. If you have spotted any errors on this page (Battleship Yamato leaves Brunei Bay with the Japanese "Centre Force" fleet) or have anything to contribute please post it on the battleship forum.